You've already got plenty of options if you're in the market for a developer board, but it might be worth taking a look at the new $49 Cubieboard, which packs quite the specs given its price point. 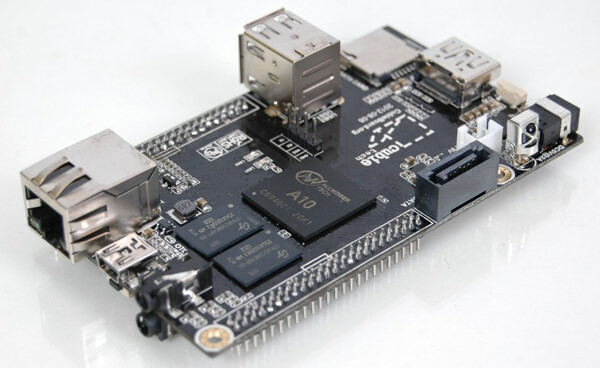 The board hosts a 1GHz AllWinner A10 Cortex A8 CPU with Mali-400 GPU, 1GB of RAM and 4 gigs of onboard storage. For ins and outs, you're looking at 1080p HDMI, Ethernet, one MultiMediaCard (MMC) slot, a SATA port, two USB hosts, an IR sensor and 96 extender pins for solder junkies. Cubieboard's Wiki page lists an additional MMC slot and USB OTG, but as this doesn't check out in the pictures, we assume they've either been scrapped, or they'll be added on for later production runs. As you would expect, several versions of Linux and Android are supported by the Raspberry Pi bully, which is expected to start shipping to select developers sometime this week. There's no word on when it may be available for general consumption, but by then you'll hopefully have a better product anyway -- if the pros have done their job, that is. Always list the source, if this article is NOT original.